In 1963, Virginia Laddey, writing for the Long Beach Independent, described Arthur Beaumont as an artist "in the grand tradition" of naval art, a tradition which has its origins in the United States beginning in World War I under "Operation Palette," the first navy-sponsored art program, and the work of Henry Reuterdahl (1871-1925). Laddey went on to say that "by nature of its commissioning, [naval art] discourages individuality and experimentation. Abstraction is anathema. The artist is not to make any qualitative judgment." It was this artistic constraint which would be a challenge to Arthur Beaumont throughout his career as an illustrator of naval events and as a ship portrait painter. His goal, as he stated it in 1933, was to make even a battleship artistic while, at the same time, maintaining a strict fidelity to accuracy in the rendering of the subject. The turning point in his career came with a one-man exhibition of his works depicting naval scenes. The show was organized by the artist in May of 1933 and held at the Villa Riviera in Long Beach. In October the exhibit was seen at the Biltmore Salon in Los Angeles, and in December Beaumont was notified by the art director of the Los Angeles Art Association that they would sponsor travel for the exhibition to the East. The show toured under the auspices of the American Federation of the Arts. It traveled for over a year and was seen in Washington, D.C., where the works were exhibited by the National Gallery of Art in the foyer of the Natural History Building, in New York, Newport (Rhode Island), Boston, Philadelphia, and Chicago, before returning to Los Angeles. 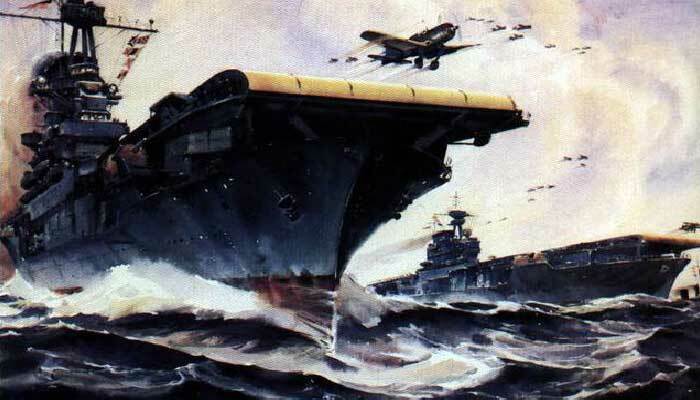 The exhibit was entitled "Our Glorious Navy," and included in the present exhibition are five works from that show: Hornet's Nest, USS Saratoga; Heavy Weather USS Oklahoma; The Robot, USS Utah; Past and Present, USS Pennsylvania and USS Constitution and In the Canal, USS Ranger. The exhibition was generally well-received with enthusiastic reviews. Edward Alden Jewell, writing in The New York Times, referred to the exhibition as "timely," in its portrayal of "a navy rapidly changing in physical appearance through necessity and modernization." Another reviewer described the exhibit as "a stirring impression of the majesty and dignity of the Navy." This was a time of peace and relative isolation from the troubles which were brewing in Europe and Asia. The US. Army was not a large or well-organized fighting force. The U.S. Navy, however, was always considered to be vital in its role as guardian of the country's shores. Thus, the public responded enthusiastically to an exhibition which reassured them of the ability of our navy to mount a defense against any aggressor. A journal of conservatism, The Daughters of the American Revolution Magazine, wrote an article about the exhibition in glowing terms. The opening paragraph made it clear that the Navy was constantly in the news and was a controversial topic with regard to the cost of its upkeep and modernization. President Roosevelt, himself a Navy man, was a staunch supporter who recognized the maintenance and modernization of the Navy to be important for the economy, providing jobs during the Depression, as well as for national defense. Beaumont was able to attend the opening of his New York show at MacBeth Gallery and described the Navy as "a protective and not an aggressive force...I am accenting the beautiful and the good in our Navy, which I really believe is its predominating quality." He also was introduced to Roosevelt during a Fleet Review in New York, at which time he was personally commended for his painting of the USS Indianapolis and the Amberjack, the Presidential yacht. While the exhibit was circulating Beaumont was serving as a Lieutenant in the Naval Reserve taking what would be the first many cruises aboard naval vessels. Beaumont's naval appointment was a result of his relationship with Admiral William D. Leahy, whose portrait he had painted in 1932. After Beaumont inquired about taking passage on naval vessels in order to pursue his career, Leahy suggested that he be commissioned in the Naval Reserve. Beaumont did serve with the Navy from August 17, 1933 to December 27, 1934; later, however, it was the cultivation of his friendships with officers of the fleet that enabled him to continue in his avowed profession. Beaumont's early paintings, such as those from "Our Glorious Navy," are, with few exceptions, stylistically compatible to those of other watercolorists working in Los Angeles in the late 1920s and early 1930s. His use of the medium was very controlled with simple areas of light washes and the drawing was simple and clear. However, by the late 1930s his style had changed; the works became bolder in composition as well as more expressive in the depiction of water and sky. It was during this period that the artists active with the California Water Color Society were also changing the manner which the medium was used; the works were splashy and expressive, with bolder brushstrokes and white paper showing through as a design element. Although Beaumont had only exhibited with the California Water Color Society from 1929 to 1931, he was nevertheless very familiar with the leading artists in the group. It is likely his association with that group of artists influenced the change in his style. In Beaumont's one-person exhibit at the Friday Morning Club in May 1937, one critic remarked on the "spontaneity and lively coloring" and the way in which the artist let "white paper add the charm of light" It was also in 1937 that Beaumont received first prize in watercolor from the California Art Club for The Wharf; an intimate, non harbor scene. With the advent of war in Europe in 1939, Beaumont was retained as a journalist illustrator by the Los Angeles Evening Herald and Express. As reports of battles came in over the wire service, the information was relayed to the artist. In a few hours Beaumont would deliver a black-ink illustration of the scene which would be used as part of a leading story in that night's edition of the paper. The paintings, created entirely from the artist's imagination, were full of action and remarkable for the speed with which they were produced, the paper commented that many persons collected the reproductions as an historic record of the war. Appreciation for the quality of his work in its realistic interpretation came from the Navy, and may have been responsible for his being commissioned in 1941 to paint a series of works for National Geographic Magazine, published in September 1941. The eight paintings were exhibited at various locations throughout the country. The accompanying text, entitled "Ships That Guard Our Ocean Ramparts," was clearly intended to reinforce public confidence in the ability of our navy to defend the country in the inevitable war. Early in 1941, Life magazine had also commissioned a number of artists, among them Californians Fletcher Martin and Paul Sample, to "show how the United States was preparing for the possibility of war." Furthermore, such projects also served to invoke a strong sense of nationalism which would reverse public sentiment toward a pacifist policy. Because of its portability and ease of handling, watercolor was a medium chosen by many of these artists who had to paint "on location" in what were not ideal circumstances. Beaumont him self, who usually worked in his studio from sketches, painted with the army on maneuvers in North and South Carolina and in the desert Southwest in the spring of 1942. These works were also published by the National Geographic Magazine in its November 1942 issue accompanied by text written by the artist. However, like many of the paintings which recorded our preparations for war, Beaumont's were tightly rendered, factual accounts and lacked much of the vitality of his navy works. Reginald Poland, Director of the San Diego Art Gallery, agreed with public opinion that the army themes were too illustrative. Yet, at the same time he noted that "some of the greatest art that has come down from the past and today lives with even greater force, is illustrative, sometimes propagandist art. After all, art, truly being of life, may be still more vital, if definitely integrated with life and its incidental facts, instead of merely being art for art's sake." 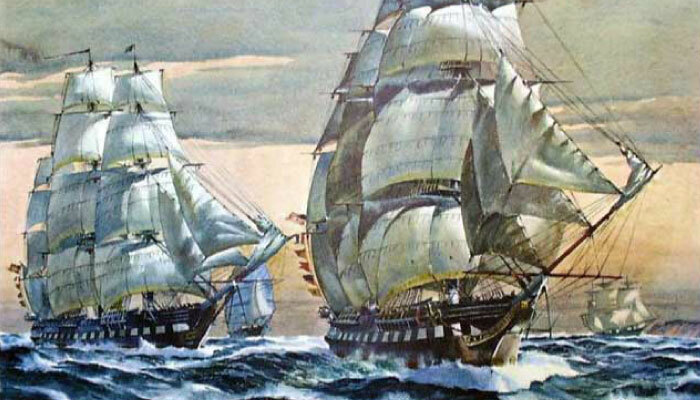 Beaumont's series in the National Geographic Magazine secured his position in the public eye as an illustrator of naval scenes. His journalistic activities during World War II were carried out under a variety of auspices, including Artist Correspondent for the Los Angeles Evening Herald-Express.15 His services were also retained by Paramount Studios to create advertising art for their movie Wake Island. One of those paintings, US Airship Attaching Japanese Warship, is included in this exhibition. His most public activity was with the City of Los Angeles in raising funds for the building of the cruiser USS Los Angeles. As part Of that effort, he created a limited edition lithograph of the Ship and a number of posters as well. As correspondent for the Herald-Express, he traveled on the shakedown cruise of the USS Los Angeles in the summer of 1945 to Guantanamo Bay where he joined the aircraft carrier USS Midway for its shakedown cruise. His first person accounts of those trips were published in the newspaper accompanied by his sketches and illustrations. One of the paintings completed from sketches made on that cruise is Mission Tokyo, included in this exhibition. Beaumont's sketching ability and technique were most effectively utilized in July 1946 when he was assigned by the Navy as one of two civilian, or "off-Navy," artists of record at the Bikini Atoll atom bomb tests, "Operation Crossroads." The sixteen paintings made of that event provide a unique record of the beginning of the nuclear age at a time when we were still mostly unaware about the ramifications of that weaponry. Beaumont himself deliberately did not protect his eyes when watching the bomb blast in order to more accurately interpret the colors of the mushroom cloud, something cameras could not record since their light meters were rendered inaccurate by the flash. He later wrote about the experience: "The huge mushroom cloud climbed upward changing color from yellow to salmon pink...from mauve to molten iron, the cloud reached about 20,000 feet, then another mushroom formation appeared near the bottom. I sketched madly, writing in the colors...After thirty minutes, the cloud was still about 30,000 feet high and still drifting." In the fall of 1947 Beaumont received permission to join the crew of the USS St. Paul on a cruise to China, Japan, and Guam. Over the next ten years he continued to paint and exhibit works depicting naval ships, and painted a series of murals. He also received a second motion picture studio commission from Universal-International Studios for The Cruel Sea. Beaumont's most challenging task, however, came relatively late in his career, from 1957 to 1961. It was during this period that he was able to secure permission to travel with major expeditions to the Arctic and Antarctic. First, in the summer of 1957, he spent seven weeks with the US. Navy's Task Group 572 West along the DEW (Distant Early Warning) line, the ring of early warning stations which alerted Canada and the United States against attack. He then made two trips to Antarctica, the first with "Operation Deep Freeze 60" from October 30, 1959, to March 13, 1960; the second with "Operation Deep Freeze 61" from November 6, 1960 to January 19, 1961. Beaumont, who found a rare beauty in these frozen areas, remarked: "People think of the Antarctic as being all white, but actually it is full of color. It's stupendous...out of this world!" 22 The pattern of ice floes, the unique abstract forms of icebergs, and the rare atmosphere, provided an unusual background for his subject. It also gave him an opportunity for greater personal expression and creativity in his work, especially in the depiction of sky and water. In Arctic Ice Blink Beaumont effectively portrays the glaring light in the sky caused by the reflection off a large ice field. The ships below seem to be imprisoned by the cold. In The First Iceberg--a compelling portrayal of the awesome beauty and danger in the Antarctic -- a ship is completely dwarfed by a enormous iceberg. Beaumont was also able to successfully depict the more human element in works such as Somewhere On Top of the World, (Point Barrow Station, Alaska), a genre piece which captures the rustic charm of the distant north. The importance and the strength of Arthur Beaumont's work lies in its being a factual, yet personal, visual interpretation of historical events. He always worked with the knowledge that his severest criticism would come from the Navy who demanded that every detail be recorded accurately Early in his career, one reviewer noted that his work was "widely recognized by the officers and men of the Fleet, who would discern at a glance if a turret or even a screw were out of place in a painting of any of their beloved vessels." Changes in the facts were only allayed if discretion was necessary in order to protect classified information. Because of this restriction, it was in the interpretation of water and sky that Beaumont allowed himself artistic license. It is there you can see his skill in the handling of the watercolor medium rich, flowing color, spontaneous and expressive brushstrokes, and abstraction of form. Many of the non-naval harbor scenes, no less historical in their recording of a time past, were done on location rather than in the studio. The sense of immediacy in these works and their more personal interpretation relate them to paintings by the artists of the California Water Color Society and to the tradition of plain air painting. 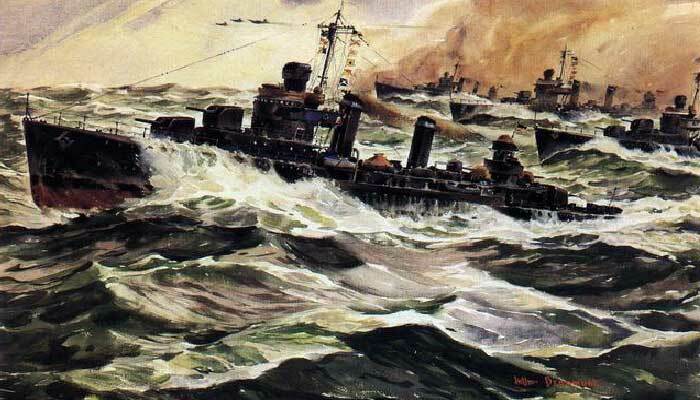 Arthur Beaumont is one of the best known of the Navy artists. Appreciation for his work continues today, eleven years after his death. Even the Navy occasionally still reproduces his work in various publications. They expressed appreciation to him in 1964 when he was awarded their highest civilian award, the Meritorious Public Service Citation for his services "as a distinguished marine artist." This essay was written for an exhibition at the Laguna Art Museum in Laguna Beach, California, which was held from May 18 to July 23, 1989.